I know you are currently living and registered in California's 30th Congressional District. If you win a seat at the next dinner with three other supporters and me, you'll get to bring a guest. I thought I'd bring one, too -- so I invited Michelle. She's in. Donate $3 or whatever you can to be automatically entered to sit down for a meal with Michelle and me. Michelle and I don't get to spend as much time as we'd like with the people who are building the 2012 campaign. But we are incredibly grateful for all you're doing, whether it's volunteering and having one-on-one conversations in your communities or chipping in what you can to help build the organization. We're looking forward to the chance to thank you in person, so I hope you'll take us up on it. No purchase, payment, or contribution necessary to enter or win. Contributing will not improve chances of winning. Void where prohibited. Entries must be received by midnight on December 31st, 2011. You may enter by contributing to Sponsor here or click here to enter without contributing. Three winners will each receive the following prize package: up to $1200 towards round-trip tickets for winner and a guest from within the fifty U.S. States, DC, or Puerto Rico to a destination to be determined by the Sponsor; hotel accommodations; and dinner with President Obama on a date to be determined by the Sponsor (approximate retail value of all prizes $4,800). Odds of winning depend on number of entries received. Promotion open only to U.S. citizens, or lawful permanent U.S. residents who are legal residents of 50 United States, District of Columbia and Puerto Rico and 18 or older (or of majority under applicable law). Promotion subject to Official Rules and additional restrictions on eligibility. Sponsor: Obama for America, 130 E. Randolph St., Chicago, IL 60601. Quincy Jones: "Peace and the Bokra song"
For the past year, I've been working on a project that means the world to me. It's a song called BOKRA, which means "Tomorrow" in Arabic. It's a project that is all about the unification of people, cultures, and religions through music. The world is at a pivotal point and it is imperative that we focus on our commonalities rather than our differences. It is our aim that this song will serve as a beacon of hope and solidarity for the Arab World at such a crucial time in its history. It is also our desire that this song reach as wide of an audience as possible -- especially in the West -- where I think it's important people witness the profound statement that is made by 24 Arabic artists from 16 different countries uniting their voices for peace and a better tomorrow. It is my firm belief that through music and entertainment we can establish a broader and more complete mutual understanding and acceptance between the United States and the Arabic-speaking world. It is our goal to eradicate the lack of communication that has led to the current divide and various misconceptions that exist between the regions. 100% of the proceeds from this song will benefit education for children in the region via the United Nations WFP and other worthy organizations. If you believe peace is possible, and that our children are the answer, please forward this video to at least 10 people who need to hear this message. CD Reissue of the Week - "Freddie Hubbard: Splash"
Produced by Freddie Hubbard & Al Hall, Jr. The London-based label BGP, a division of Ace Records, is reissuing today, November 28th, Freddie Hubbard's "Splash." Originally recorded in 1981 for Fantasy, now property of Concord Records, this album appears on CD for the very first time through BGP's "Funk & Jazz Classics" series. It comes with its original artwork plus brand new sleeve notes by Dean Rudland. And no bonus track. A giant of the jazz trumpet -- and my personal favourite trumpeter, alongside Miles Davis, and followed by Lew Soloff and Randy Brecker --, Hubbard signed with Fantasy after long stints at Blue Note, CTI and Columbia. "Splash" was conceived as a project destined to hit both the contemporary jazz and R&B charts, featuring many vocal tracks, funky beats, and a dated sonority based on the disco-music formula. It comes from a time when Hubbard was trying to emulate Chuck Mangione's style, with its instrumentation including such things as syndrums, solina, Al Hall's flugabones, and Arp & Prophet synths. Sought after in particular for one track that features Jeanie Tracy's lead vocals, "You're Gonna Lose Me," it became a big favourite with the modern soul crowd in UK. But the best track is the instrumental "I'm Yours," co-written by Clarence McDonald & Al Hall, Jr. Other highlights are Freddie's playing on "Jarri" (using flugelhorn) and "Mystic Lady," and the summertime funk of "Sister 'Stine," with handclaps and a Prophet 5 solo by (Santana's longtime keyboardist) Chester Thompson, then a member of Tower of Power; not to be mistaken with Genesis' second-drummer Chester Thompson, who also recorded with Hermeto Pascoal and Flora Purim. 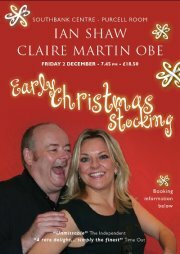 Christmas comes glamorously early this year, as two of the UK's finest jazz singers -- Ian Shaw & Claire Martin -- thrill you with their annual show, exclusive to Southbank Centre. From Ella to Steely Dan via Shirley Horn, Joni Mitchell and Nick Cave, this BBC Award-winning duo enthral in this intimate setting. 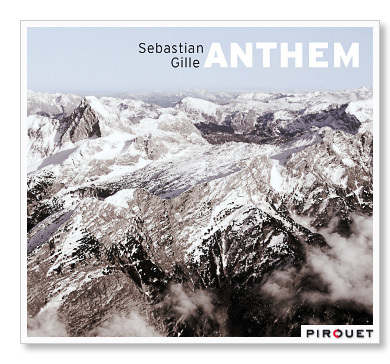 CD of the Week - "Sebastian Gille: Anthem"
Sebastian Gille, is a saxophonist of exceptionally fine musicality, a jazz musician whose music has stylistic coherence, highly cultivated intensity, and absorbing tonal beauty. "Anthem," his debut album as a leader, is a session that is searching for the sounds that come from deep within, and that is what makes this music exceptional. Highlights: Kurt Weil's "Barbara-Song" and the sublime ballad "You Won't Forget Me" (F. Speilman-K. Goell), popularized by Shirley Horn. Gille was born February 1st, 1983 in Quedlinburg, Germany, and comes from a musical family. At the age of 14 Sebastian Gille began to play saxophone, and discovered the music of Miles Davis and Wayne Shorter. At 19 he won the "Yamaha Sax Contest", and began to study with alto saxophone giant Phil Woods. A little later he became a member of the German National Jazz Orchestra under the direction of Peter Herbolzheimer. In 2004 the 21-year-old moved to Hamburg to study at the Conservatory for Music and Theater. In 2009 Gilles formed his own quartet with Pablo Held, Robert Landfermann and Jonas Burgwinkel, which finally debuts on Pirouet Records through this intriguing "Anthem." DJ Hana's 2nd Anniversary Party Spinning at Kitchen 305, Nov 30! 100 CD's Hana's mix "Kitchen 305" to give away! DAILY SPECIAL JUST LIKE THE PUB! !EVERY DAY!!! EP of the Week - "David Guetta: Erotica 19"
Come meet the gorgeous MAXIM MODEL Heather Shanholtz at Kitchen 305 - Newport Beachside Resort as she hosts International Thursdays next December 1st. 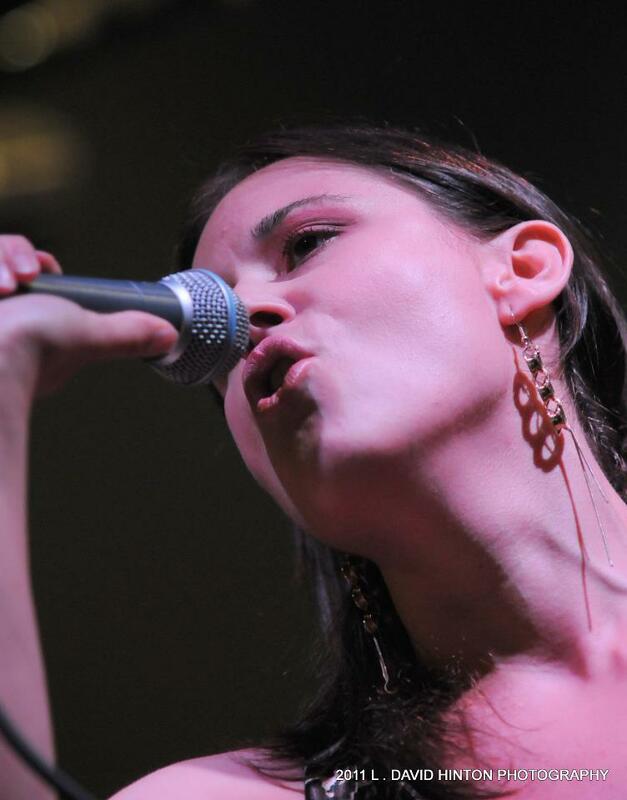 Enjoy a captivating night with Maria Rivas' latin-jazz band! Plus great food and drink specials! Marion Holmes DeFore, the wife of late actor Don DeFore and a vocalist who had a hit with "I'm a Little Teapot" in the 1940s, died Nov. 17 in Santa Monica. She was 93. DeFore's version of "I'm a Little Teapot," recorded with Art Kassel and His Kassels in the Air Orchestra, was a top 20 hit in January 1942. She also worked during her career with Jule Styne, Buddy Rogers, Gene Krupa and Henry Busse and for a time performed live on WGN radio every Saturday night from the Walnut Room in Chicago's Bismarck Hotel, where she met her future husband while he was in the area filming the 1942 film "The Male Animal," starring Henry Fonda and Olivia de Havilland. The DeFores married in Los Angeles on Valentine's Day 1942 -- Judy Garland served as matron of honor -- and were married for 51 years until Don's death in December 1993. Don DeFore is perhaps best known for playing next-door neighbor "Thorny" on "The Adventures of Ozzie and Harriet from 1952-56" and "Mr. B," who employed Shirley Booth as a maid, in the 1961-65 sitcom "Hazel." The DeFores owned Don DeFore's Silver Banjo Barbecue Restaurant in Disneyland from 1957 to 1962. Later, Marion worked as a Brentwood-based residential real estate agent for more than 30 years. Survivors include children Penny, David, Dawn, Ron and Autumn, 12 grandchildren and 15 great-grandchildren. In lieu of flowers, the family asks that donations be made to the Bel Air Presbyterian Church in Los Angeles to assist inner-city youth. R u ready to face the after Gobble Gobble Day with a jazz performance? 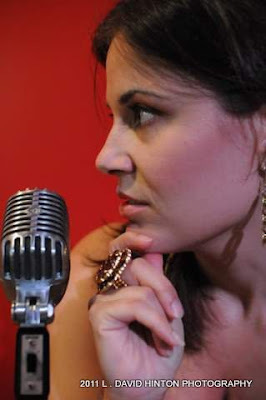 Nancy Goudinaki will be on Sunday night @ Sasa's Lounge (924 Columbus Avenue, NYC) with George Burton. They'll be swinging from 8 to 12! Get Down and Get Funky for the Holiday Season! Treat yourself to a whole new world of funk music when the phenomenal Mike Longo Funk Band returns to "Jazz Tuesdays" on Tuesday, November 29 in the Gillespie Auditorium at the New York Baha'i Center at 53 East 11th Street (between University Place & Broadway). There will be 2 shows at 8:00 and 9:30. Admission is 15.00, 10.00 for students. Who do you want to meet the President? According to our files, you are currently living and registered in California's 30th Congressional District. We just launched our next Dinner with Barack contest, and this time there's a big new twist: Each winner can invite a guest. So as you celebrate Thanksgiving tomorrow, look around the table and ask yourself: Who would you bring? It's hard to think of a better gift for your parent, spouse, child, or best friend than the chance to accompany you to dinner with President Obama. To be automatically entered right now, make a donation of $3 or whatever you can today. When you do, you'll be helping fund this campaign as we near a critical fundraising deadline at the end of the year -- just three days before voters in Iowa head to the caucus and the 2012 election formally kicks off. President Obama wants to connect face to face with the people who are chipping in however they can to grow this campaign. So this time we're asking the three people who win to bring along a guest: maybe your significant other, or the friend who first got you involved in this movement. I'd bring my mom. Thanksgiving is a perfect time to start thinking about whom you'd pick. National Finance Director - Obama for America"
Fan of Oprah Winfrey, tune in! Hi all, if you are an Oprah fan, don't miss this interview! Kindly tune in to hear..."Kacey On the Radio" interviews Oprah Winfrey's Network President Sheri Salata! New York veteran radio talk show host Kacey Morabito will interview the head of Oprah Winfrey’s Network (OWN) Harpo Studio’s President, Sheri Salata, on her radio talk show Kacey On The Radio www.kaceyontheradio.com airing on 100.7 WHUD and www.whud.com at 6:30am Sunday morning, November 27, 2011. The topic of discussion focuses on Oprah's television future and the exquisite new book The Oprah Winfrey Show: Reflections on an American Legacy. Past guests on Kacey On The Radio include many high profile newsmakers/experts in their field such as Journalist Lisa Ling of Our America, Author Peter Walsh - Enough Already!, Author Geneen Roth - Women, Food and God, as well as positive laughs from Comedian and Saturday Night Live alumni Jim Breuer. Topics generally discussed range from creating peace in our lives and home to diet and holistic medicine. Spreading good news is her joie de vive! Winner of the New York State Broadcasters Award and Westchester’s Best Radio Personality, Kacey Morabito recently celebrated her 11th anniversary on the WHUD morning show. Kacey is a long time resident of the Hudson Valley and has been involved in her local community appearing at many charity functions including the Westchester Teen Idol event and the Children's Miracle Network Radiothon. She recently was honored by the JIMMY Foundation for her dedication to community advocacy. Kacey is co-host on the Mike & Kacey in the Morning show, weekdays 5:30am-10am on WHUD, focusing on news and information. It is the #1 morning show in Westchester and the Hudson Valley. In 2005 the New York State Broadcaster's Association honored Mike & Kacey as the Best Morning Show in the state. They also won "Best Morning Show" from Hudson Valley Magazine in 2008. Kacey has won Best of Westchester from readers of Westchester Magazine in 2010 and 2011. Sheri Salata is responsible for the OWN company's new programming for syndication, primetime, cable, radio, digital and emerging platforms, and oversees original programming slate on-air and in development. Sheri also served as Executive Producer of The Oprah Winfrey Show, the most successful show in daytime television for the past 23 consecutive seasons. 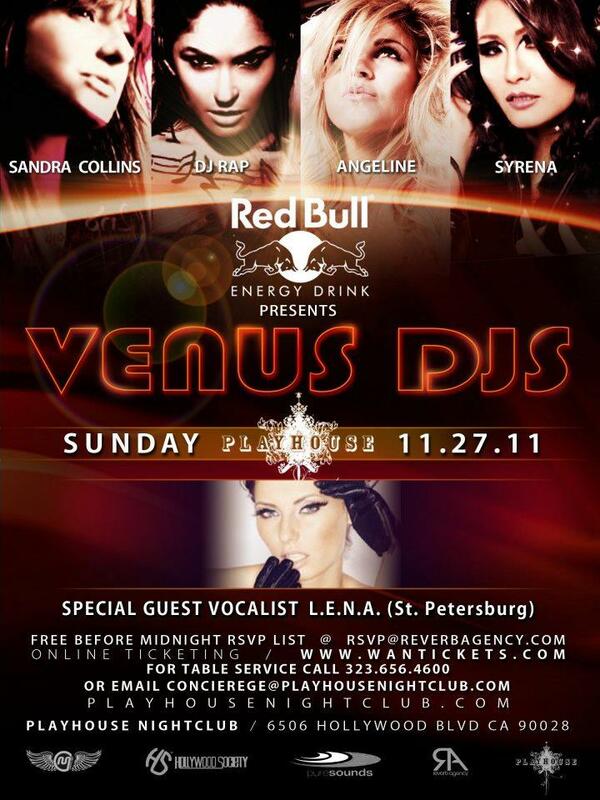 Crew: Sandra Collins; Dj Angeline; Dj Rap; Dj Syrena, L.E.N.A. The owner of the legendary Birdland nightclub has gone loony, his ex-fiancee claims in a new lawsuit. In papers filed in Manhattan Supreme Court, songbird Hilary Kole says nightclub impresario Gianni Valenti forced her to leave him with his "threats and extreme behavior" this past May -- and has been stalking, harassing and threatening her ever since. Last month, he called Kole "and informed her that he was intending to show up at her October 22 performance at Lincoln Center to cause a tumultuous commotion for the sole purpose of embarrassing" her, the suit says. He's also threatened to "make intimate photographs, videos, recordings and e-mails of her public by releasing them on the Internet." Kole, 36, now has an order of protection against her 63-year-old ex, but is suing to get her stuff back. Valenti had a dark side, and repeatedly told her "he would kill her if she ever tried to leave," the suit says. She was forced to do exactly that in May, and has been paying a price ever since, she says. The suit claims he's left her numerous threatening messages, shown up outside her new boyfriend's home and violated the order of protection "by sending written materials to her home and by sending her text messages." A lawyer for Valenti did not return a call for comment. A sultry songbird who has trilled at the Rainbow Room is now squawking in Manhattan Supreme Court over sour notes from her former manager/boyfriend, the owner of the iconic jazz club Birdland. Hilary Kole, 36, is charging that John Valenti, 63 -- furious since she left him in May -- threatened to kill her, harassed her with more than 100 phone calls, tried to sabotage her career and hijacked their joint savings. Kole, a rising star in the world of jazz singers, was, at 21, the youngest vocalist ever to have a regular gig at the Rainbow Room. She has since performed at Carnegie Hall, Lincoln Center and abroad and has recorded with jazz greats Oscar Peterson and Michel Legrand. She is asking the court to break her management and production contracts with Valenti and to order Valenti and his accountant, Howard Weiss, to return more than $556,000 in savings that they accumulated between 2004 and 2011. Kole says in court papers that she and Valenti shared a joint checking account, bought furniture for homes in Manhattan and the Hamptons and established an investment portfolio. They also agreed to be heirs in each other's wills. Valenti helped her make two albums and she performed regularly at Birdland -- helping him double his revenue at the club, she says. But the good times came to a bitter end. Kole said she moved out on May 2 because of her lover's "extreme behavior," including a threat to put "intimate photographs, videos, recordings and emails of her" on the Internet. "Since May 2, 2011,... Valenti has stated (to Kole) 'I better not see you walking down the street or you will pay,'" according to court records. In June, Kole said, she got phone calls from a stranger telling her precise details of where she had been and with whom. In late September, she said, Valenti parked outside her current boyfriend's home. Kole said she got a court order of protection after Valenti called to say he planned to show up at an Oct. 22 performance at Lincoln Center and cause "a tumultuous commotion for the sole purpose of embarrassing" her. A month later, she said, Valenti violated the order by sending written materials to her home and barraging her with text messages. Kole's lawyer, Lawrence Garbuz, said he could not comment on the case until Valenti is served with legal papers. He said his client was traveling and unavailable to comment. Valenti's lawyer, Ivan Saperstein, said he was withholding comment until he had a chance to read the court papers. 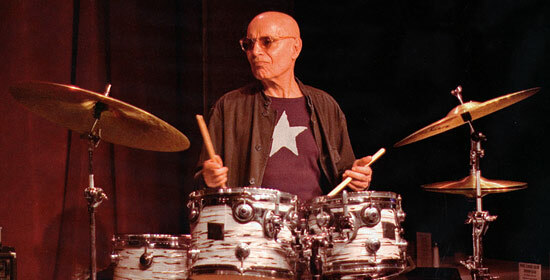 We have just got the sad news about the death of Paul Motian, who passed away a few hours ago, at 4:52 am, at Mount Sinai Hospital in NY. 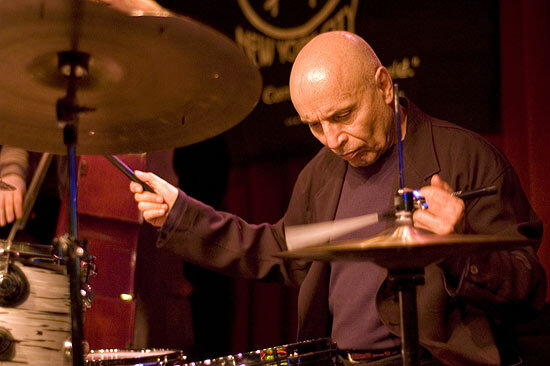 A masterfully subtle drummer and a superb colorist, Paul Motian was also an advanced improviser and a challenging bandleader with a taste for challenging post-bop. He grew up in Providence and began playing the drums at age 12, eventually touring New England in a swing band. Motian moved to New York in 1955 and played with numerous musicians - including Thelonious Monk, Lennie Tristano, Coleman Hawkins, Tony Scott, and George Russell - before settling into a regular role as part of Bill Evans' most famous trio (with bassist Scott LaFaro), appearing on his classic albums "Sunday at the Village Vanguard" and "Waltz for Debby." In addition, Motian freelanced for artists like Mose Allison, Charles Lloyd, Carla Bley, and Charlie Haden's Liberation Music Ensemble, and turned down the chance to be John Coltrane's second drummer. In 1972, Motian recorded his first session as a leader, "Conception Vessel," for ECM, followed by "Tribute" in 1974. He formed a regular working group in 1977 (which featured tenor Joe Lovano) and recorded several more dates for ECM, then revamped the ensemble to include guitarist Bill Frisell in 1980. Additional dates for ECM and Soul Note followed, and in 1988 Motian moved to JMT, where he recorded a long string of fine albums beginning with "Monk in Motian." During the '90s, he also led an ensemble called the Electric Bebop Band, which featured Joshua Redman. 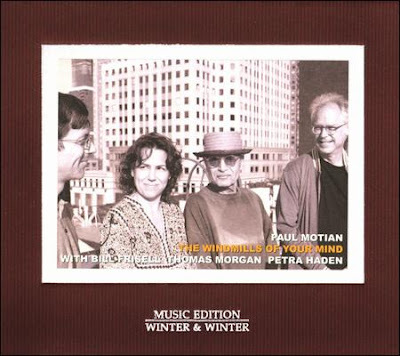 In 1998, Motian signed on with the Winter & Winter label, where he began recording another steady stream of albums, including "2000 + One" in 1999, "Europe" in 2001, and "Holiday for Strings" in 2002. In 2005 Motian returned to Manfred Eicher's ECM label, releasing such CDs as "I Have the Room Above Her," "Garden of Eden", "Time and Time Again" and, more recently, "Lost in a Dream" (2010) and "Live at Birdland" (2011). His latest release came out last August, released on the Winter & Winter label: "The Windmills of Your Mind," cut in September 2010 with Bill Frisell, Thomas Morgan and Petra Haden. Rest in Peace. 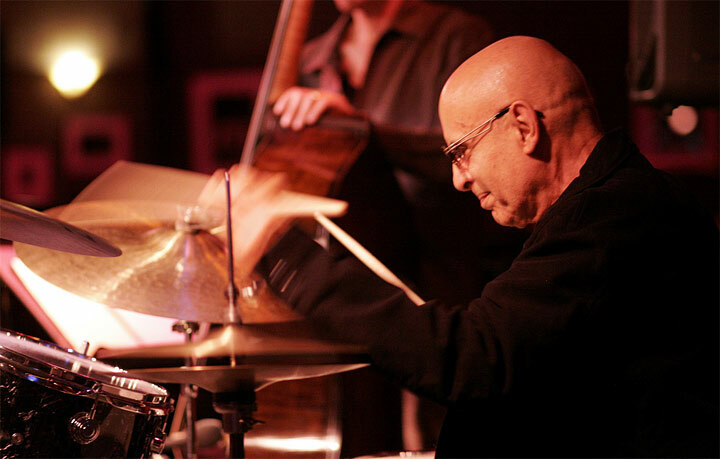 Paul Motian, a beautifully subtle, versatile drummer who recorded with a wealth of jazz artists over his long career, died early Tuesday in New York City. He was 80. The cause was complications of myelodysplastic syndrome, a bone-marrow disorder, his friend Carole d’Inverno Frisell told the New York Times. First rising to prominence as a member of Bill Evans' trio on landmark recordings such as "Waltz for Debby" and "Sunday at the Village Vanguard," Motian also enjoyed long partnerships with Keith Jarrett, Bill Frisell and Charlie Haden on top of a long, rich career as a bandleader that began with "Conception Vessel" in 1972. In recent years, Motian showed little signs of slowing down, with 2011 yielding albums with saxophonist Bill McHenry and a recording from a generation-spanning 2009 show with Brad Mehldau, Haden and Lee Konitz, "Live at Birdland." Needless to say, there are a wealth of recordings available online to remember Motian. Paul Motian, a drummer, bandleader, and composer of grace and abstraction, and one of the most influential jazz musicians of the last 50 years, died early Tuesday morning at Mount Sinai Hospital in New York. He was 80 and lived in Manhattan. The cause was complications of myelodisplastic syndrome, a bone-marrow disorder, said his friend, Carole d’Inverno Frisell. Mr. Motian was a living connection to some of the groups of the past that informed what jazz sounds like today: he had been in Bill Evans’s great trio in the late 1950s and early 1960s, playing on the albums “Waltz for Debby” and “Sunday at the Village Vanguard,” and in Keith Jarrett’s American quartet during the 1970s. But it was in the second half of his life that Mr. Motian found himself as a composer and a bandleader, and his own work took off. He worked steadily, and for the last six years or so almost entirely in Manhattan, with the support of the record producers Stefan Winter and Manfred Eicher, who streamed out his albums, and Lorraine Gordon of the Village Vanguard, who eventually booked his groups for up to four or five weeks per year. Then there were the many musicians he played with regularly, including the saxophonist Joe Lovano and the guitarist Bill Frisell, with whom he kept a working trio; the pianist Masabumi Kikuchi and the saxophonists Greg Osby and Chris Potter, with whom he played in trios and quartets; the members of the Electric Bebop Band, with multiple electric guitars, which in 2006 became the Paul Motian Band; and dozens of other musicians, from young unknowns to old masters. For almost all of his bands, his repertory was a combination of terse and mysterious originals he composed at the piano, American songbook standards, and music from the bebop tradition: Bud Powell, Thelonious Monk, Charlie Parker, Charles Mingus. Obama: "You and a Guest"
You are receiving this message beacuse, according to our files, you are currently registered and living in California's 30th Congressional District, having joined "Obama for America" four years ago. A few Thursdays ago, I had dinner with four Americans named Ken, Casey, Juanita, and Wendi -- the winners of the campaign's first Dinner with Barack contest. I loved getting to know each of them. We're taking names for the next dinner starting now, and this time I want to add a new feature: If you win, you can bring a guest. Chip in $3 or more today to be automatically entered to win a spot for you and a guest at the next dinner. The folks who this election is all about tend to fall under the radar of the D.C. pundits and traditional news media. They're people like Juanita, who helped put her three sons through college on a teacher's salary while saving what she could for retirement. Like Ken, a single dad who stood by his mother as she fought insurance companies while battling two forms of cancer. They're like Casey, whose three young kids may not yet appreciate what courage it took for their dad to take a chance and start his own business. And Wendi, an artist and third-generation teacher who canvassed, marched, and phone banked in Indiana in 2008, the year her home state defied the traditional electoral map. These people weren't just there for themselves -- they were representing you, this movement, and the folks I go to work for every day as president. These dinners are important to me because I want to spend time whenever I can with the people who sent me here. They're proving wrong the conventional wisdom that says campaigns should cater to Washington lobbyists and powerful interests. And they're an important reminder that this movement -- and my presidency -- have never just been about me. I'm proud that we're choosing to run the kind of campaign where a dinner like this isn't just possible, it's a regular thing. And next time, I don't just want to meet you -- I want to meet someone else in your life. From left to right: percussionist José Soares, pianist/leader Sergio Mendes, drummer João Palma, bassist Bob Matthews, and singers Lani Hall & Bibi Vogel. 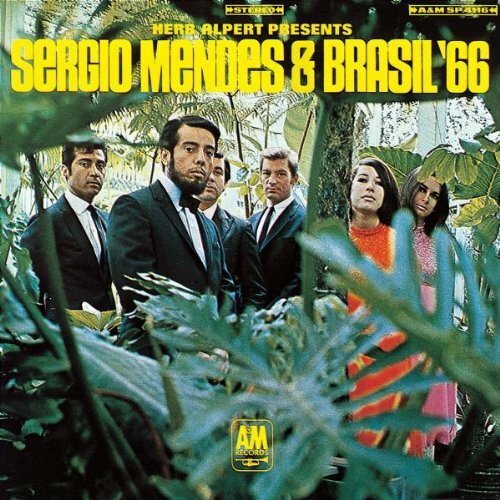 These are the great musicians and vocalists who recorded, in 1966, the groundbreaking "Herb Alpert Presents Sergio Mendes & Brasil '66" for A&M Records. With the stunning version of Jorge Ben's "Mas Que Nada" as the first single that exploded in the airwaves, peaking at #4 in the "Adult Contemporary Singles" and # 47 in the "Hot 100 Pop" charts of the Billboard magazine, the LP became an instant best-seller and an instant classic, reaching #2 among the "Jazz Albums" and # 7 in the "Pop" chart of Billboard. Few people are aware of Bibi Vogel (1942-2004) as one of the original singers in the first incarnation of Brasil '66. She wasn't credited in the original vinyl LP cover. Either any of the musicians were mentioned, and all became very upset about it. The gorgeous brunette Bibi Vogel, who also worked in Brazil as a model and an actress, decided to leave the group, and was quickly replaced by the blond Janis Hansen, who did most of the TV shows and toured worldwide, although Vogel performed at the Carnegie Hall concert that opened their coast-to-coast American tour. This explains why all the CD reissues of "Herb Alpert Presents Sergio Mendes & Brasil '66" ignore Vogel and wrongly credit Hansen as the second vocalist. As far as I know, Mendes never talked about it; at least in terms of an official statement. And nobody ever asked him about Vogel either. Regrettable. Anyway, in spite of all these "politics," the good news is that this legendary album - which, besides "Mas Que Nada," includes great versions of "Going Out of My Head," "Day Tripper," "O Pato" and "Slow Hot Wind" - has just been inducted to the Grammy Hall of Fame. SANTA MONICA, Calif., Nov. 21, 2011 -- Continuing the tradition of preserving and celebrating great recordings, the Recording Academy announces the newest additions to its legendary Grammy Hall of Fame collection. Highlighting diversity and musical excellence, the collection acknowledges both singles and album recordings of all genres at least 25 years old that exhibit qualitative or historical significance. Through a tradition established nearly 40 years ago, recordings are reviewed annually by a special member committee comprising of eminent and knowledgeable professionals from all branches of the recording arts, with final approval by the Recording Academy's National Board of Trustees. 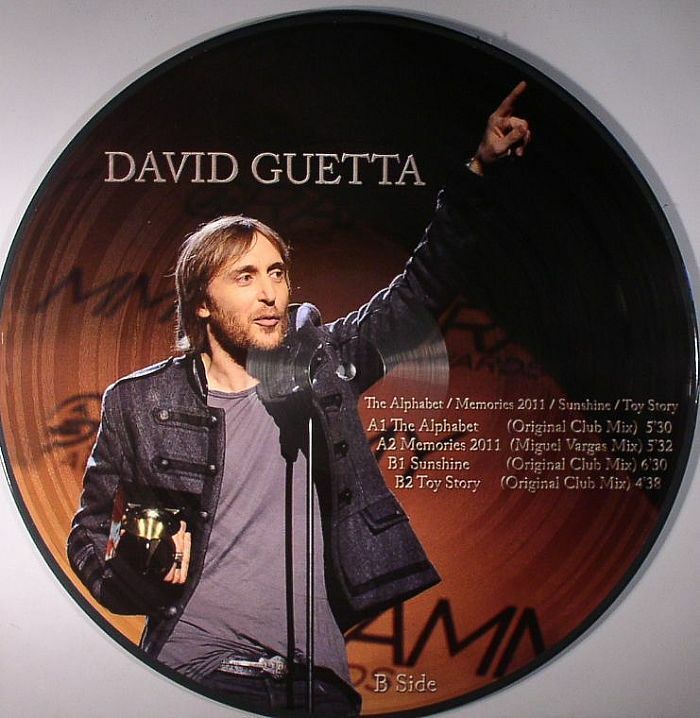 With 25 new titles, the list currently totals 906 and is displayed at the Grammy Museum. "The Recording Academy is dedicated to celebrating a wide variety of great music and sound through the decades," said Neil Portnow, President/CEO of the Recording Academy. "We are especially honored to welcome this year's selection of some of the most influential recordings of the last century. Marked by both cultural and historical significance, these works truly have influenced and inspired audiences for generations, and we are thrilled to induct them into our growing catalog of outstanding recordings." Representing a great variety of tracks and albums, the 2012 Grammy Hall of Fame inductees range from Bruce Springsteen's "Born in the U.S.A." album to civil rights activist Dr. Martin Luther King Jr.'s "I Have A Dream" speech from his historic 1963 address at the March on Washington. Also on the highly regarded list are Cole Porter's "Anything Goes," the Rolling Stones' album "Exile on Main St.," Gloria Gaynor's "I Will Survive," Grandmaster Flash and the Furious Five's single "The Message," Bill Cosby's comedy album "I Started Out as a Child," the original Broadway cast recording of "St. Louis Woman," Tina Turner's "What's Love Got to Do With It" and "Herb Alpert Presents Sergio Mendes & Brasil '66." Others inductees include the entire Anthology of American Folk Music, Gene Autry, Crosby, Stills, Nash and Young, Doris Day, the Serge Koussevitzky-conducted Boston Symphony Orchestra, Los Panchos, Santana, and Paul Simon, among others. The 54th Annual Grammy Awards will be broadcast live on Feb. 12, 2012, at 8 p.m. ET/PT on the CBS Television Network. 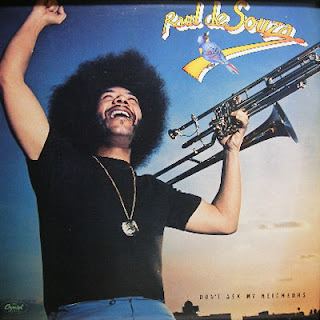 Two cult albums recorded in LA in the late '70s, for Capitol Records, by Brazil's top trombonist ever, Raul de Souza, will be reissued on CD in Japan next December 21. Both were produced by George Duke and engineered by Kerry McNabb at Paramount Studios in Los Angeles, having reached the Billboard jazz charts. 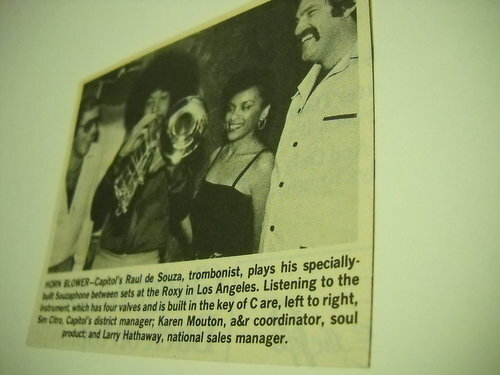 "Sweet Lucy" (1977) was Raul's groundbreaking debut fusion album for Capitol, after the overlooked jazz masterpiece "Colors" (produced by Airto Moreira in 1974 with such guests as Cannonball Adderley, J.J. Johnson, Jack DeJohnette & Richard Davis, and released in 1975 on the Milestone label), which was produced by Arnaldo DeSouteiro for CD reissue in 1999 as part of Fantasy's Original Jazz Classics series; btw, DeSouteiro also produced, in 2001, for BMG, the first CD reissue ever of Raul's debut album as a leader in Brazil, "À Vontade Mesmo" (RCA, 1965). The first digital release of "Sweet Lucy" came out in Germany, on the EMI Electrola label back in the 90s, but soon was sold-out and, oddly, was never re-printed, becoming one of the most expensive out-of-print CDs in jazz history. Its title track, released as a 45rpm single in the USA and as 12"EP in Europe, became a dancefloor hit during the disco years. 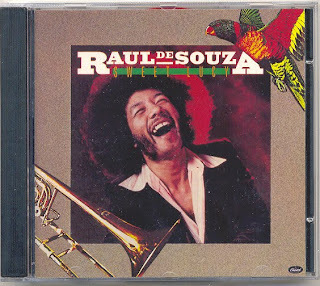 The album also includes a funky version of João Donato's "Banana Tree" ("Bananeira" aka "Vila Grazia"), Lonnie Liston Smith's "A Song of Love," and three strong originals by Raul: the gorgeous ballad "Wild and Shy" (featuring Freddie Hubbard on flugelhorn), "At Will" (an electrified remake of "À Vontade Mesmo") and the epic "Bottom Heat." Patrice Rushen, Byron Miller, Leon "Ndugu" Chancler, Ian Underwood, Airto and Earth Wind & Fire's guitarist Al Mckay are among the sidemen. Due to contractual reasons, George Duke performs on three tracks using the nickname Dawilli Gonga, while Weather Report's bassist Alphonso Johnson is credited as Embamba. "Don't Ask My Neighbors," which is being reissued on CD for the very first time, originally came out in 1978 and also sold very well, peaking at #26 in the Billboard Jazz Charts. Its main single, George Duke's penned "Daisy Mae," was the only track (from that album) included in some CD compilations released in Europe during the 90s, after having reached the status of a dancefloor classic during the acid-jazz heyday. The program includes the delightful title track on which Raul showcases his creative phrasing skills on the tenor-bass trombone, Harvey Mason's "La La Song" (the first time ever he used the Souzabone on a recording! ), a wildly brilliant arrangement - by Raul himself - of Wayne Shorter's "Beauty and the Beast" (originally heard on the "Native Dancer" LP), nice covers of Michel Colombier's "Overture" and Michael Henderson's "At The Concert," plus two compositions by our trombone hero: "Jump Street" and "Fortune," the latter co-written with Marilyn Castles, his American wife at that time. Once again, Raul performs with an all-star cast: Harvey Mason, Ndugu, Azar Lawrence, Manolo Badrena, Airto, Byron Miller, Robert "Pops" Popwell, and two great guitarists from the '70s jazz scene that later disappeared: Roland Bautista (who performed at the Rio/Monterey Jazz Festival in Rio de Janeiro, back in 1980, in an all-star group with Raul de Souza, George Duke, Stanley Clarke, Ndugu and Airto) and Charles "Icarus" Johnson (who played with Duke's superband, alongside Sheila Escovedo, at the first São Paulo/Montreux Jazz Fest in São Paulo in 1978, and also recorded on Airto's "I'm Fine. How Are You" album for Warner.) Raul's third and final album for Capitol, "'Til Tomorrow Comes," a controversial disco session, remains unreleased on CD format, but shall be released in 2012. Above, the promo pic from Raul de Souza's press kit distributed at the time of the original release of "Sweet Lucy." Below, a photo taken at the backstage of Roxy Theater in LA, after the release concert of "Don't Ask My Neighbors." Raul plays his Souzabone watched by members of Capitol Records' staff. 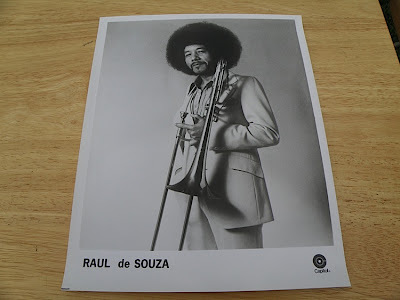 Tomorrow night, November 23, Raul de Souza will be taping his first official DVD during a concert at the SESC Vila Mariana Theater in São Paulo, with such special guests as Altamiro Carrilho, João Donato and Hector Costita. In 2006, Raul's concert with the Jazz Sinfônica Orchestra @ Sergio Cardoso Theater was filmed for a DVD release that never happened due to the legal issues. There's also a haunting short-film documentary titled "Viva Volta," exhibited in some movie festivals in 2005 but never commercially released. It was directed by Heloisa Passos, with screenplay by Daniela Capelato & Malu Tavares. CD Reissue of the Week - "Lonnie Smith: Mama Wailer"
Featuring: Ron Carter, Chuck Rainey, Billy Cobham, Airto Moreira, Richard Pratt, William King, Jimmy Ponder, George Davis, Robert Lowe, Danny Moore, Marvin Cabell, Dave Hubbard and Grover Washington, Jr.
"If Lonnie Smith considers himself “the doctor of groove,” then Mama Wailer is certainly his doctoral thesis. This 1971 record was only the second of Creed Taylor’s Kudu productions and, surprisingly, the only Kudu or CTI session Lonnie Smith ever participated in. But the record has become a jazz-funk classic; one of the rarest of rare grooves and still highly sought after by young dancers and DJs alike," Payne stated. "All in all, it’s a superb collection of long, exploratory ideas on the nature of groove and the real “turning point” in Lonnie Smith’s musical thinking." 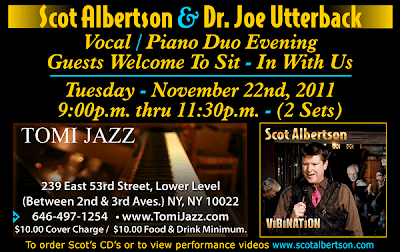 After a sold-out performance last November 3, with Keith Ingham (piano) & Arthur Lipner (vibes), the great vocalist Scot Albertson returns tomorrow night, November 22, to Tomi Jazz in a duo appearance with pianist Dr. Joe Utterback, singing songs from Albertson's latest CD "Vibination." 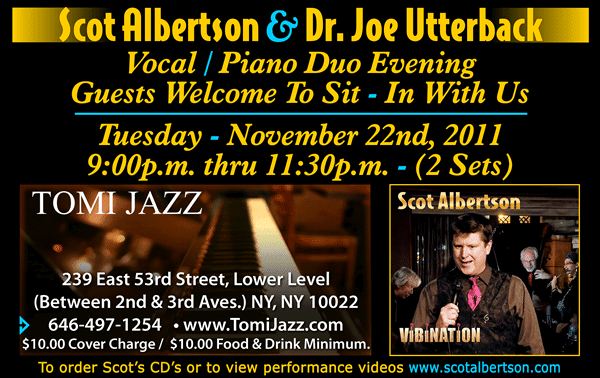 Tomi Jazz is located @ 239 East 53rd Street, between 2nd & 3rd Avenues. 2 sets. $10 cover charge, $10 food & drink minimum. For reservations, please call (646) 497-1254. EP of the Week - "David Guetta: Erotica 18"
CD of the Week - "Nicola Conte: Love & Revolution"
World-famous composer and arranger Russ Garcia died peacefully at his Kerikeri home at the weekend, aged 95.Garcia was a composer and arranger who wrote a wide variety of music for screen, stage and broadcast. He collaborated with many musical and Hollywood stars, including Ella Fitzgerald, Louis Armstrong, Walt Disney, Orson Welles, Ronald Reagan, Judy Garland, Henry Mancini, and Charlie Chaplin. He was born in Oakland, California, but had lived in New Zealand for some time. At the height of his career in 1966, Garcia and his wife, Gina, left the United States and set sail for the Pacific, eventually coming to New Zealand and falling in love with the Far North.Garcia continued to compose and arrange from his Kerikeri home up until his death. Wellington voice teacher Charles Humphreys commissioned one of Garcia's last arrangements in March last year. "Russ is a very generous man," Humphreys said. "From the first time I spoke to him I could tell that this was a man who was peaceful and full of the kind of love of life and people that we all search a lifetime to possess. He wrote a lovely arrangement of East of the Sun for me and said 'well I think that will be the last peace of music I'll be writing'. "I reckon he knew that he might be continuing to write somewhere else. We shall miss him." A celebration of his life is to be held at 1.30pm in the events hall of the Turner Centre in Kerikeri on Sunday, November 27. JazzNewswire November 21, 2011 - Jazz composer and arranger Russell Garcia, renowned for his collaborations with Duke Ellington, Stan Kenton, Anita O'Day, Ella Fitzgerald, Louis Armstrong, Judy Garland, Frances Faye, Mel Tormé, Frank Sinatra and numerous others as well as film scores for George Pal's "The Time Machine" and "Atlantis: The Lost Continent" and his orchestrations for Charlie Chaplin's "Limelight," died Sunday, November 20, 2011. He passed away peacefully at his home in Kerikeri, New Zealand, with Gina Mauriello Garcia, his lyricist and wife of 59 years, by his side. He was 95. 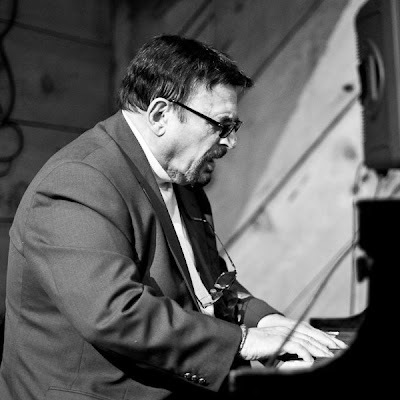 In April, Mr. Garcia performed three 95th birthday concerts throughout New Zealand with New York vocalists Shaynee Rainbolt and Terese Genecco and New Zealand singer Tim Beveridge. Mr. Garcia, who was fondly known as "Uncle Russell" by his much-younger musical collaborators around the world, was scheduled to continue his 95th birthday celebration during a three-city U. S. tour at jazz clubs in Los Angeles (Catalina's), Oakland (Yoshi's) and New York City (Iridium), but he suffered collapsed vertebrae the week before he was set to travel. Instead, the Los Angeles concert was cancelled and his tour partners, Ms. Rainbolt and Ms. Genecco, paid tribute to Mr. Garcia and his music at Yoshi's on November 1 and at Iridium on November 6. The Garcias enjoyed the Oakland concert via Skype while the New York celebration was streamed live, with Mr. Garcia and his wife commenting on the music and musicianship throughout both evenings. "It's hard to believe that we're sitting here in New Zealand on Monday afternoon taking part in a live concert in New York on Sunday evening," Mr. Garcia said about the technology of live stream. Russell Garcia was born April 12, 1916, in Oakland, CA. 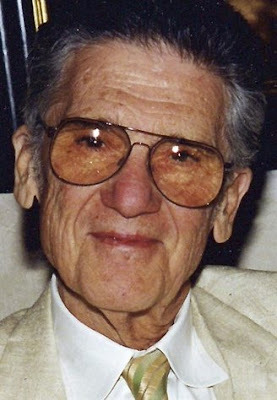 Throughout his career, the jazz composer provided arrangements for many singers and instrumentalists and recorded more than 60 albums under his own name. In addition, his book, The Professional Arranger-Composer, has been a valued tool for both beginners and veterans since it was written in the mid-'40's. When describing the orchestral sounds that emerged from the West Coast jazz scene during the 1950's, the name of jazz composer Russell Garcia always comes to mind. In 2007, Mr. Garcia entrusted Ms. Rainbolt to record the first-ever album of all Garcia originals entitled Charmed Life. Arranged by Mr. Garcia for his signature four-trombone band, this collaboration included a U.S. tour and garnered two MAC (Manhattan Association of Cabarets and Clubs) Awards for Best Jazz Recording (Charmed Life) and Best Song (I Remember, Music by Garcia and Lyrics by Rainbolt & Garcia.) A top seller on CDBaby, the album also was chosen by TalkinBroadway.com as one of their Top 10 CDs of 2008. 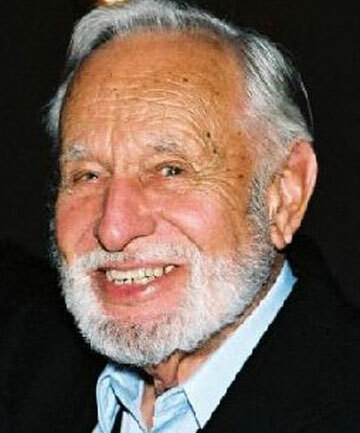 In addition to his wife Gina, whom he married 60 years ago on December 24; Mr. Garcia is survived by his daughter and son-in-law Judy and Henry Kulp of California; four grandchildren, Kristy Corwin-Dupont, Sean Lurie and Melody Kulp-Reinstein of California and Donny Kulp of Hawaii; and seven great grandchildren, Curtis Corwin, Capri Corwin, Kaden Lurie, Collis Lurie, James Reinstein, Lila Reinstein and Ginger Mancia-Kulp, all of California. Mr. Garcia was preceded in death by his son, David Garcia, in 2007. Go here to read the interview with Russ Garcia that was published in the October issue of Jazz Inside Magazine. 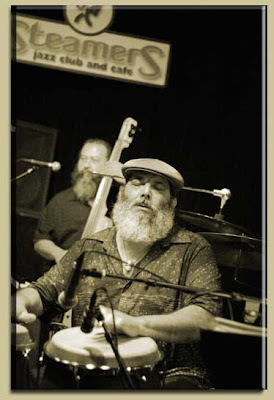 Poncho Sanchez @ Steamers, tomorrow night! If music were about pictures, percussionist Poncho Sanchez's music would best be described as a kaleidoscopic swirl of some of the hottest colors and brightest lights to emerge from either side of the border. At any given show, on any given record, fragments of Latin jazz, swing, bebop, salsa and other infectious grooves collide and churn in a fiery swirl, with results that are no less than dazzling. All of these sounds and more come together in "Psychedelic Blues," Sanchez's twenty-fourth recording on Concord Records. "The last couple records have gone a little heavy on the soul music, which has gone over really well in our live shows, but we wanted to do more of a straightahead Latin jazz record this time - something in the tradition of our earlier Concord records that we made back in the '80s." Sanchez remained with Cal Tjader until the bandleader's death in 1982. That same year, he signed with Concord for the release of "Sonando!," an album that marked the beginning of a prolific musical partnership that has spanned more than 25 years and has yielded two dozen recordings.Whether it's salsa, straightahead jazz, Latin jazz, or even elements of soul and blues, the mesmerizing array of sounds and colors from Poncho Sanchez's youth have telegraphed across the decades and continue to inform his creative sensibilities to this day. "There's room for a lot of different sounds in our music," he says. "I think people have come to know that that's what Poncho Sanchez is all about. We put it all together in a pot, boil it together and come out with a big stew. 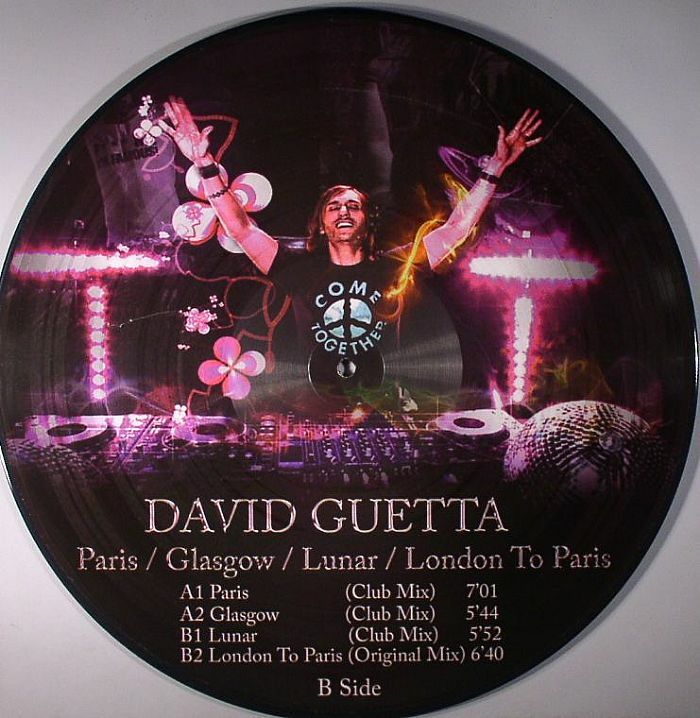 This isn't some marketing strategy to sell records. These are the sounds I grew up with. So when I play this music, I'm not telling a lie. I'm telling my story. This is the real thing." COME MEET THE MIAMI DOLPHINS CHEERLEADERS AT THE NEWPORT BEACHSIDE HOTEL & RESORT AND GET YOUR PICTURE WITH AUTOGRAPH! THIS THANKSGIVING EVE, WEDNESDAY THE 23RD! Jill Biden: "Sign Joe's card"
According to our files, you are currently registered in California's 30th Congressional District. I know I don't usually send you emails, but Joe has a birthday coming up this Sunday, and I'm trying something new. The First Family and I are putting together a special card for him, and we'd like as many supporters of this campaign as possible to add their names and messages for Joe. Because the year ahead is going to be a big one -- not just for Joe and me, but for all of us. We've all got some work to do. 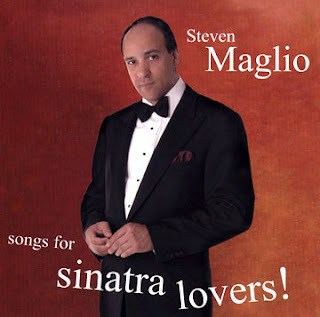 Critically acclaimed singer and performer Steven Maglio is pleased to announce the international release of “Songs for Sinatra Lovers!” to commemorate the fifth anniversary of the original recording. The project will now be available outside of the United States via iTunes and CD Baby in Europe (Austria, Belgium, Denmark, Finland, France, Germany, Greece, Ireland, Italy, Luxembourg, Netherlands, Norway, Portugal, Spain, Sweden, Switzerland), Japan, Australia, New Zealand, UK and Mexico. In addition, iTunes introduced 12 new European territories, Bulgaria, Cyprus, Czech Republic, Estonia, Hungary, Latvia, Lithuania, Malta, Poland, Romania, Slovakia and Slovenia. To highlight the anniversary of the recording and celebrate the expanded availability, Mr. Maglio is writing a series of guest blog posts for Limelight, an online mechanical licensing clearance service (www.songclearance.com) powered by RightsFlow, a leading licensing and royalty service provider. The weekly posts provide insightful anecdotes about the 11 iconic songs on the CD, entitled “Frank Fridays: Cover Songs for Sinatra Lovers”. The Limelight utility, used for clearances for the U.S. release of “Songs For Sinatra Lovers”, is a simple online tool currently being used by tens of thousands of musicians and bands to easily and legally clear cover songs for their releases. An accomplished singer of standards, Maglio is greatly regarded for his renditions of songs made popular by Frank Sinatra. His “Songs for Sinatra Lovers!” CD includes 11 classic Sinatra hits, from romantic ballads to swinging tunes. The collection features favorites such as “Come Dance with Me, “ You Make Me Feel So Young,” “Put Your Dreams Away,” and “Nancy” (with featured accompaniment by renowned guitarist Bucky Pizzarelli, a veteran of Walter Wanderley's group and John Pizzarelli's father.). The project was produced by Bill Gulino and Jay Dittamo with Music Directors Mark Walsh and Bill Gulino. As a matter of fact, Vic Damone, upon hearing Steven said, "I thought I was listening to Sinatra's records." Mr. Maglio’s career trajectory continues to rise on both musical and theatrical fronts. His long-running nightclub act, “Sounds of Sinatra”, occurs to a packed-house weekly at The Carnegie Club (156 West 56th Street, New York City), and is a testament to his popularity. Each Saturday evening he continues to swing with the 11- piece Stan Rubin Orchestra as part of two shows: “Sinatra: Remembering The Sands" at 8:30PM, followed by "Sinatra Songs" during the 10:30PM set. Additionally as a working actor, Steven will appear in the soon-to-be-released film, “Goat”, featuring an all-star cast headed by Armand Assante and Ice-T. He recently appeared in “Once More With Feeling,” starring Chazz Palminteri and Drea de Matteo. Lee Pockriss, who wrote the music for midcentury pop hits like "Itsy Bitsy Teenie Weenie Yellow Polka Dot Bikini," "Catch a Falling Star" and "Johnny Angel," died on Monday at his home in Bridgewater, Conn. He was 87. His death was confirmed by his nephew Adam Pockriss. Perry Como made a hit of the gentle ballad "Catch a Falling Star" ("Put it in your pocket / Save it for a rainy day"), which Mr. Pockriss wrote with Paul Vance, in 1957. Shelley Fabares introduced Mr. Pockriss and Lynn Duddy's wistful love song "Johnny Angel" ("I dream of him and me / And how it's gonna be") as her teenage character on the family sitcom "The Donna Reed Show" in 1962. But in between, Mr. Pockriss struck a very different note in another collaboration with Mr. Vance: "Itsy Bitsy Teenie Weenie Yellow Polka Dot Bikini," a novelty number about a young woman "afraid to come out of the water" and be seen in the revealing swimsuit she was wearing. Her reluctance was understandable, because the navel-revealing bikini was still considered relatively shocking outside Hollywood and the French Riviera. In fact, the song has been credited with helping it gain acceptance. Brian Hyland had a No. 1 hit with the song in 1960, and it was so inescapable as part of popular culture that a Hollywood film, Billy Wilder's "One, Two, Three" (1961), affectionately lampooned it with a scene in which East German soldiers tortured a character (played by Horst Bucholz) by forcing him to listen to the song repeatedly. Mr. Pockriss also worked in musical theater for decades. He wrote the music and Anne Croswell wrote the lyrics for the 1963 Broadway show "Tovarich," for which Vivien Leigh won the Tony Award for best actress in a musical. The two also collaborated on "Ernest in Love," a musical version of Oscar Wilde's "Importance of Being Earnest," first produced off Broadway in 1960 and revived by the Irish Repertory Company in 2009; "Conrack," based on Pat Conroy's book, which had an Off Broadway production in 1987; and "Bodo," about a 12th-century goatherd, produced at the Promenade Theater in 1983. With the lyricist Carolyn Leigh and Hugh Wheeler of "Sweeney Todd," Mr. Pockriss created "Gatsby," a musical based on F. Scott Fitzgerald's novel "The Great Gatsby," in 1969. It was best known as an unproduced work, but this year it received two concert performances as part of the New York Musical Theater Festival. David Rooney, reviewing it in The New York Times, said that the songs succeeded in "evoking Fitzgerald's characters, spreading a beguiling carpet of melancholy beneath all that jazz age revelry." "It made me curious," he added, "to see a full production." Mr. Pockriss also wrote songs for "Sesame Street," including "My Polliwog Ways," sung by Kermit the Frog. Lee Julian Pockriss was born on Jan. 20, 1924, in Brooklyn, the son of Joseph and Ethel Price Pockriss. He attended Erasmus Hall High School and Brooklyn College, and studied musicology at New York University. He served in the Army Air Forces during World War II as a cryptographer in the South Pacific. He is survived by his wife, Sonja, and a brother, Harold. Mr. Pockriss's talent was recognized early. In 1950 The Times reported the presentation of an American Federation of Music Clubs award. The $100 first prize in composing went to a young graduate student, Lee Pockriss, of 325 Ocean Avenue, Brooklyn. Don't miss! 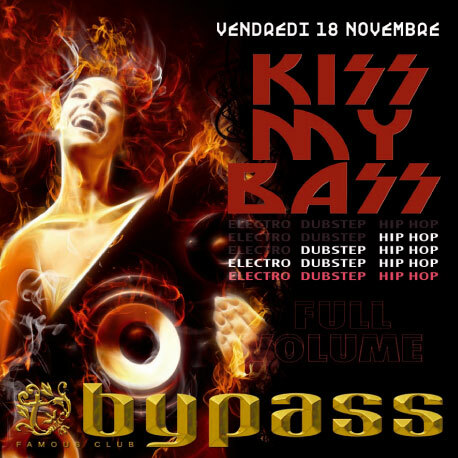 The best party for electro, dubstep and hip hop fans @ my favorite dance club in Switzerland. See u there! This Friday, Architecture in Helsinki are up from the land down under, performing at Irving Plaza with Swedish electro-duo Lo-Fi-Fink and sun bronzed Greek gods Dom (well, actually they hail from Massachusetts). We can't think of a better concert to kick off the weekend, and if you're the lucky one, we've got your tickets. Email giveaway@othermusic.com to enter. CD Reissue of the Week - "Johnny Hammond: Wild Horses Rock Steady"
The title of organist Johnny Hammond’s second CTI/Kudu outing is a dead giveaway. Combining the names of The Rolling Stones’ classic “Wild Horses” and Aretha Franklin’s “Rock Steady” gives a good glimpse into the eclectic nature of this release even before the first notes of the recording are heard. Hammond and an incomparable band of sidemen (including Grover Washingtion, Jr., Ron Carter and Billy Cobham among many others) take on standards from the pop world as well as pop-based Broadway show tunes “Who is Sylvia” from Galt MacDermot’s "Two Gentleman of Verona," and “I Don’t Know How to Love Him” from "Jesus Christ Superstar," all with a jazz/soul/funk groove that is as unique as it is unmistakable. "Wild Horses Rock Steady", recorded @ Van Gelder in October-November 1971, was Johnny Hammond's second of his five albums for Creed Taylor (counting the four on Kudu and "Gambler's Life," produced by Larry Mizell for Salvation, another CTI subsidiary). Back in 2001, I had the honor to produce the first CD reissue ever of "Wild Horses..." released in Japan on the "Kudu Best 12" series I supervised. Since the sales were very good, I was authorized to reissue it once again in 2007 on the "I Love Kudu" series. Johnny Hammond’s "Breakout," a typical unpretentious soul-jazz session recorded on June 1971, made history as the first album released by the Kudu label, as well as the session which introduced Grover Washington, Jr. to Creed Taylor. Four months later, Grover once again was recruited as one of the main soloists for Hammond’s second album for Kudu, "Wild Horses Rock Steady," a more ambitious project. Creed wanted it to be a crossover album, with strings and horns sections, and full of jazz stars acting as sidemen. Its smart title (for sure chosen by Creed) mixes the names of two important tracks, then pop hits. "Wild Horses," a Mick Jagger/Keith Richards tune, appeared on Rolling Stones’ "Sticky Fingers," while "Rock Steady," composed by Aretha Franklin, was on her "Young, Gifted & Black" LP, also from 71, on which Eric Gale and Bernard Purdie, two of Hammond’s sidemen, also took part. The opening tune, "Rock Steady," feature solos by Hammond, Eric Gale (using the wah-wah pedal) and Grover, with Ron Carter on electric bass and Bernard Purdie doing those incredible funky drum breaks. Actually, the album repertoire is irreprehensible. Another highlight, "Who is Sylvia?," is a Galt MacDermot song for a stage play, "The Two Gentleman of Verona." Hammond plays the lyrical melody and the first solo on the electric piano. During Grover’s burning tenor solo, he quotes Eleanor Rigby near the end, and then Johnny starts an explosive second solo, this time on the organ. Bob James supplies a subtle string arrangement, with a very soft bossa beat provided by Billy Cobham on drums and Ron Carter on acoustic bass. On both "Rock Steady" and "Who is Sylvia?" Airto uses a typical Brazilian instrument called caxixi (there’s also a reco-reco on McDermot's song) while Omar Clay plays tambourine. George Benson is the acid guitar soloist on a funky version of "I Don’t Know How To Love Him," one of the main themes written by Andrew Lloyd Weber and Tim Rice for the rock opera, "Jesus Christ Superstar." Both Bob Mann and Melvin Sparks play the rhythm guitar parts. Bob James adds strings (actually, only eight violins – no violas or cellos!) and horns (with muted trumpets and trombones near the end of the track) in a lush orchestration, with Airto playing congas and bells. Cat Stevens’ "Peace Train" (originally from Stevens’ album "Teaser & The Firecat") gets a jazzy treatment, with Ron sublime in a walking bass line. Bob once again uses the brass section, opening the solo spot to the underrated late tenorist Harold Vick, honored by Sonny Rollins in a tune ("Did you see Harold Vick?") from his album, "This Is What I Do." Probably the most surprising song on the album, "It’s Impossible" was originally written by Mexican composer Armando Manzanero as a romantic bolero. It is really almost impossible to believe how superbly Johnny Hammond recreates this song, transforming it in a highly-energized jazz vehicle played in a very fast tempo, including some of the best solos ever recorded by both Hammond and Grover, stimulated by an intoxicating beat that Cobham provides. Not even Bob James’ mellow strings diminish the tremendous impact of such a fantastic performance. CD of the Week - "Come Sunday: Crosscurrents"
The Chicago septet Come Sunday melds jazz form and gospel tradition on their striking debut CD, "Crosscurrents." Taking their name and inspiration from Duke Ellington's groundbreaking 1958 collaboration with gospel queen Mahalia Jackson, Come Sunday reinterprets time-honored spirituals and gospel classics -- plus Stevie Wonder's "Heaven is 10 Zillion Light Years Away," and, of course, Ellington's "Come Sunday" -- in musically innovative, emotionally uplifting ways. The arrangements, by the group's guitarist Mike Allemana, brim with melodic, harmonic, and rhythmic surprise. 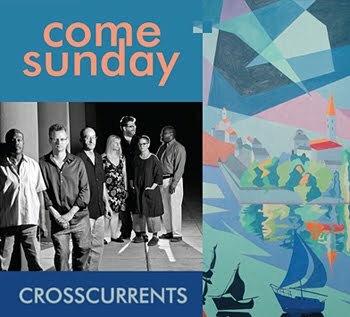 "They smartly balance gospel sentiment and the jazz impulse to refresh (and sometimes entirely remake) these familiar spirituals," critic Neil Tesser wrote about Come Sunday in the Chicago Jazz Music Examiner. "You don't need to love folk music or gospel to appreciate what Allemana has done here, transforming songs from those sources into swinging and memorable renditions; more often than not, they recall the 'soul jazz' of the 60s, crossed with the cool, rich harmonies of contemporaneous groups like the Swingle Singers and the Double Six of Paris." In addition to Allemana, the group is comprised of vocalists Bill Brickey, Sue Demel, Alton Smith, and Lindsay Weinberg, as well as bassist Al Ehrich and drummer Lenny Marsh. The disc's title refers not only to the unique musical fusion the group achieves but also to the recurring water themes that flow through the set of songs that includes "Jesus Gave Me Water," "Down by the Riverside," "Wade in the Water," and "Deep River." "I found that a common thread between gospel and jazz was the improvisational nature of the expression of melodies, the strong rhythmic feeling, a spiritual feeling in the music, and improvisations based around a theme," says Allemana, who's recorded three albums as a leader and has been a mainstay of saxophonist Von Freeman's band since 1997. "The biggest challenge was to make each song its own unique journey. It was so rewarding to see how my ideas came to life with this band. The singers brought so much of their own voices to the music, adding things I hadn't thought of." All seven members of Come Sunday teach at Chicago's venerable Old Town School of Folk Music, as well as performing with a variety of other groups. The impetus for the group came when Ehrich approached Allemana, Brickey, and Demel to record the spiritual "The Welcome Table" (in Allemana's jazz arrangement) for the 2007 multi-artist CD "Old Town School Songbook: Volume 4." That recording turned out so well that Brickey suggested they add two other vocalists and a rhythm section to delve further into the jazz-gospel convergence. At their first rehearsal, in 2008, the seven members clicked perfectly -- and decided to form a permanent group. Brickey has been Come Sunday's musical visionary, says Allemana: "He introduced me to all the gospel artists, he brought the music to me, and he also trusted me totally so I was able to write whatever I wanted." Brickey, who has an avid interest in the history of the Civil Rights Movement, was struck by how some of the songs on Crosscurrents -- "Keep Your Hand on the Plow" and "I'm on My Way to Canaan Land," in particular -- had been adapted during the freedom struggles of the 1960s to lift spirits during demonstrations and the mass jailings that often followed. "The singing was powerful, and it gave unity to the people," he says. Come Sunday's next recording project will expand on these themes and focus on old gospel tunes that became Civil Rights-era anthems. "Emotional integrity is the common thread that brings all these musics together," Brickey states. "In music inspired by gospel, the musicians rely on genuine emotions to help them convey meaning vocally and instrumentally. It is the essential characteristic of 'emotional integrity' that gave birth to blues, jazz, r&b, and finally rock 'n' roll. We owe an entire culture of musical diversity to African gospel music." Mark Murphy live @ Yoshi's Oakland, Nov. 14! CD of the Week - "Rahsaan Barber: Everyday Magic"